Natural gas storage build accelerates, despite a marginal weakening in US gas output. Bull speculators significantly unwind gas exposure, indicating a downward pressure on the flammable markets. Warmer-than-average temperatures are expected to develop over the country, sending UNL shares further south. Despite recent UNL steadiness, I am now short UNL. 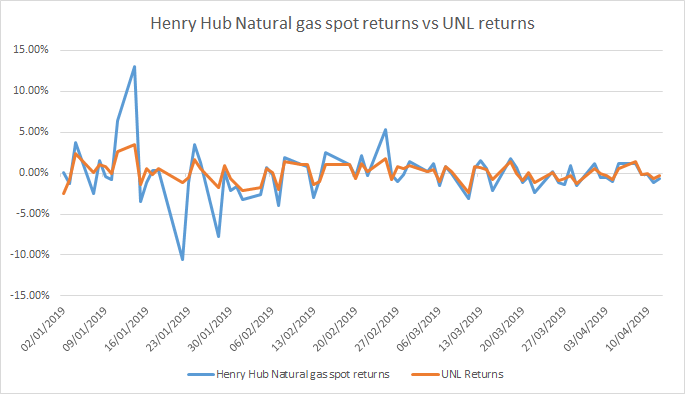 UNL is directly correlated to the daily changes in the spot price of natural gas delivered at Henry Hub. 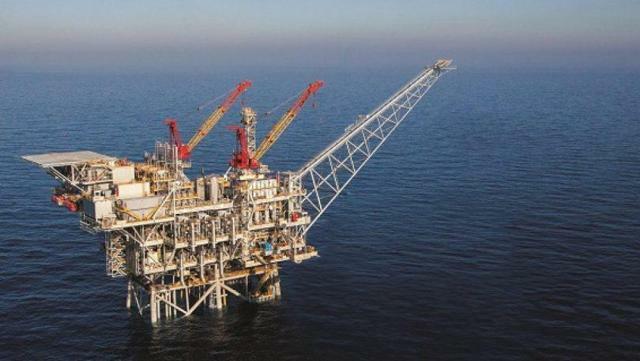 It measures the average price changes of 12 futures contracts on natural gas traded on the Nymex, containing the near-month contract to expire and the contracts for the following 11 months. Besides, the fund spreads its future exposure equally across the nearest 12 contract months in an effort to minimize the impact of contango returns. In order to reduce incurred rolling costs and limit exposure to expiring natural gas future volatility, the fund’s strategy could prematurely decide to shift its exposition on the next month contract to expire. This is actually the case this month, as there is no direct exposure on the May 2019 future contract. 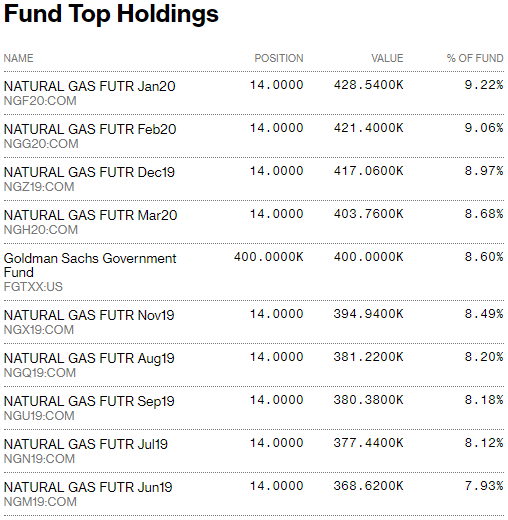 According to Bloomberg, the fund holdings on natural gas futures declined marginally 76.84% and increased to 8.6% on the Goldman Sachs Government Fund. UNL offers an expense ratio of 0.88%, lower than its main competitor (UNG), establishing at 1.29%. However, UNL’s average spread on the last 60 days is 0.7%, compared to just 0.04% for UNG. 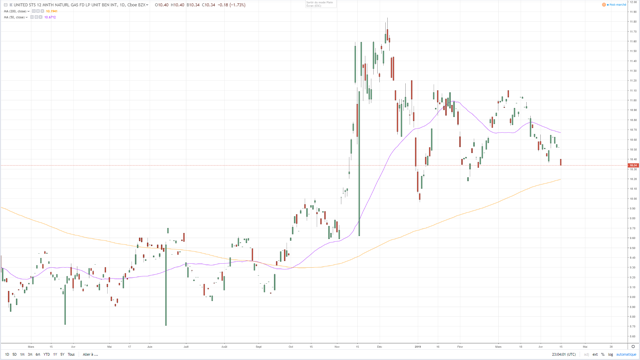 This downside is explained by the liquidity of the discussed ETF, totaling an average daily volume of $36.32m for UNG versus a much lower $26.15k for UNL. However, unless you are an institutional investor, UNL’s liquidity conditions are sufficient. 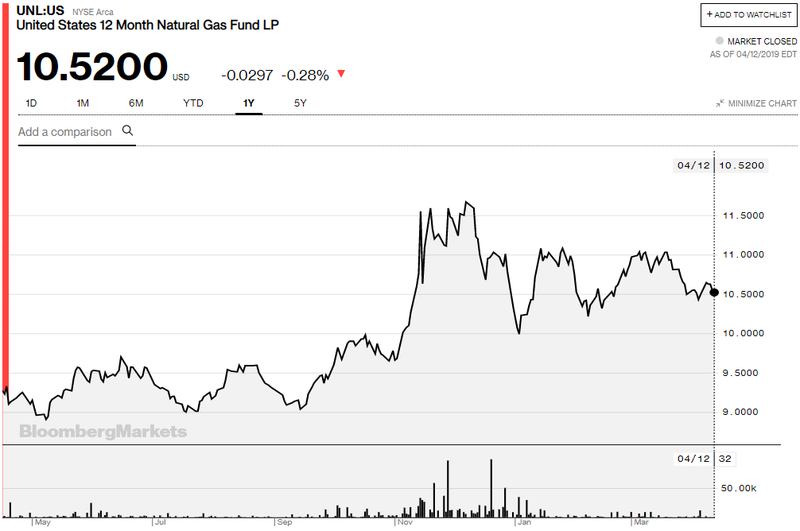 Nevertheless and in spite of higher costs, the diversification of UNL on the 12 natural gas future contracts provides less risk for investors exposed to the underlying commodity. American natural gas storage lifted for the second consecutive week on the March 29–April 5 period, up 2.21% (w/w) to 1,155 Bcf, EIA shows. With this build, the injection season starts stronger than last year's, amid robust US production boost. Concomitantly, these consecutive injections allowed storage seasonality to steadily improve on a yearly basis, establishing now in a deficit of 13.5% or 180 Bcf, but still remains in a strong shortage compared to the 5-year mean of 32.1% or 546.4 Bcf. Despite that, the storage picture of the natural gas complex remains bearish for UNL shares, given that current deficit is likely to quickly be counterbalanced by growing US natural gas output. The supply-demand balance continues to weaken on the April 4–10 period, despite the slight decrease in US aggregate supply. During the week, US supply decreased 0.7% (w/w) to 93.9 BCf/d, following slowing marketed and dry production, which was partially offset by growing net imports from Canada. On the other side, natural gas demand in the US dips abruptly, down 9.4% (w/w) to 76.5 Bcf/d. This robust decrease has been induced by plummeting residential consumption, down 25.6% (w/w) to 19.5 Bcf/d and was slightly offset by growing power needs, up 4.1% (w/w) to 22.8 Bcf/d and an uptick in Mexican exports, up 2.2% (w/w) to 4.7 Bcf/d. Given this backdrop, UNL shares should continue to wane in the following week, amid warmer-than-normal spring temperatures. Besides, net speculative length on Nymex natural gas futures continues to deteriorate, down a whopping 77.37% (w/w) to 36,827 net short contracts, on the April 2–9 period, whereas UNL shares lifted marginally, up 0.71% (w/w) to $10.63. This robust decline is explained by robust long liquidations, down 6.46% (w/w) to 228,853 contracts and marginally enhanced by short accruals, up 0.1% (w/w) to 265,680 contracts. In spite of the declining spec length interest on Henry Hub contracts, UNL’s exposure on natural gas futures declined during the week to 76.84%, indicating the Fund is expecting renewed headwinds on natural gas futures prices. Since the beginning of the year, net spec positioning dipped almost four-fold, down 363.12% or 28,875 contracts, whereas UNL’s yearly performance accelerates compared to last week, up 2.66% to $10.63 per share. 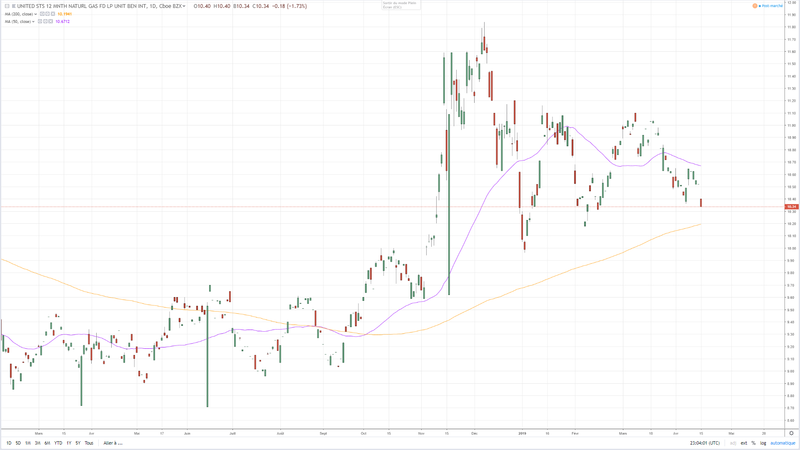 Since my last article published on April 9, UNL shares advanced marginally, following an improving weather pattern, which provided sufficient substance for natural gas bulls. With this short-term catalyst behind us, the complex is poised for further weakness, given weaker weather-driven demand expectations. Indeed, during the weekend, weather guidance trended significantly lower in terms of anticipated gas demand. Latest National Weather Service forecast shows a considerable temperature warm-up across much of the country. 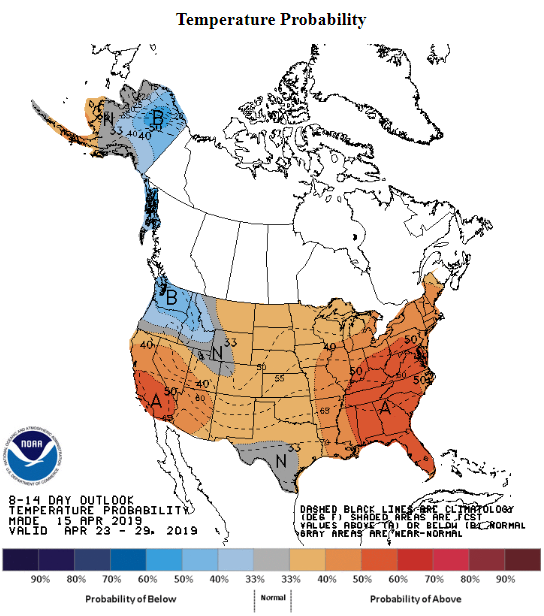 Weather guidance is expected to hit above-average temperatures in the Southwest and on the East Coast, making it difficult to get notable cold air and therefore weighing on demand for natural gas. Besides, natural gas deliveries to Mexico are expected to steeply decline in the following days, following maintenance at the NET Mexico Pipeline and Agua Dulce Compressor Station in South Texas. The flow reduction will likely further deteriorate demand for the flammable complex and pressure natural gas pricing and its proxy UNL. That being said, UNL’s backdrop continues to deteriorate, following an acceleration in the natural gas injection pace, dipping speculative interest for the flammable commodity and warming weather forecasts. These developments are pressuring UNL shares and should continue to do so until the shoulder season-end. I therefore expect UNL to further head south during the coming days and maintain my bearish view on the Fund.